Diptyque was one of the first "niche" fragrance houses to edge its way into my consciousness, and I still remember the day I purchased my first bottle of L'Ombre dans L'Eau at a boutique in Philadelphia. (That was eight years ago, and I still wear L'Ombre every summer.) More recently, I wished aloud that Diptyque would create a rose-centered fragrance, and my request has been noted by the fragrance gods and goddesses: Diptyque's newest release is Eau Rose, "a totally new fragrance that pays tribute to the queen of flowers, the rose," with notes of bergamot, blackcurrant, lychee, hedione, geranium, Turkish rose, cedar, musk, and honey. I must say that Eau Rose's label and box, with their pink-accented illustrations of trellis-climbing roses, are among the prettiest designs I've seen in a long time. They also raised my expectations before I had even smelled the fragrance itself. So, what did I think? According to the description on the Diptyque website, Eau Rose is composed to "to celebrate the multiple aromas of the flower in its natural state, as it blossoms over time." That works for me. Eau Rose begins on a fresh-flower note, with the citrus and black currant giving it a certain brightness while never translating as an obviously "fruity-floral" blend. The heart of the fragrance is a true rose accord, the kind that makes my rose-loving heart skip a beat. It's not deep or velvety or spicy; it's closer to a tea rose than I would have guessed, and it definitely evokes the winsome pink roses on the label rather than a passionate red rose. The dry down has a subdued honey note and some soft musk to keep it from turning too sweet. Eau Rose has good staying power for an Eau de Toilette, and it will be an ideal choice for a spring fragrance a few months from now. As Victoria recently noted in her own review at Bois de Jasmin, Eau Rose isn't going to change the history of perfumery, but it does a beautiful job of recreating a freshly-picked rose from a sunny garden. I enjoy wearing it in the same way I enjoy wearing my favorites from Les Parfums de Rosine. (In the Rosine "spectrum," it would fall somewhere midway between the airy Diabolo Rose and the lusher Secrets de Rose.) 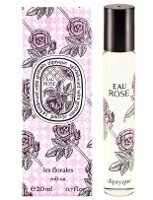 And it's far superior to some of the rose-oriented perfumes that have disappointed me over the past year or so, such as Dolce & Gabbana Rose the One and L'Eau d'Issey Florale. It would be a nice step into niche perfumery for someone who has already enjoyed Stella, or a good acquisition for someone who has used up her last bottle of Creed's discontinued Fleur du Thé Rose Bulgare. In other words, I like Eau Rose very much and I'm glad to see it join the Diptyque family. (I've heard that it will be a permanent addition, eventually packaged with the traditional Diptyque black-and-white graphics, although the related Rosa Mundi candle is limited edition.) One last note: Diptyque says that Eau Rose was inspired partially by the sixteen-century poet Pierre de Ronsard's verse “Mignonne, allons voir si la rose...", which you can read here (and here, in English translation). Enjoy! Diptyque Eau Rose Eau de Toilette is available as an 100 ml atomizer bottle ($98, shown at top) or a 20 ml roll-on travel bottle ($48, shown just above). For purchasing information, see the listing for Diptyque under Perfume Houses. This is a very timely review for me. For the last couple hours I have been comparing Yosh Sottile, SSS Velvet Rose, and Shiseido White Rose. Would you be able to compare it with any of those, or with DelRae Coup de Foudre? I like the idea of a rose soliflore, but many of them turn too sour on my skin, and others seem to be way too oversweetened, perhaps as an attempt at compensation. Hi, 50! Well, let me think… YOSH Sottile is very pretty, but also has a noticeable muguet note, and doesn’t last long (on me, anyway). Coup de Foudre disappointed me, for some reason; I’d have to re-read my review to remember why! I think it just seemed a little linear and thin to me. (Perhaps sour, too?) I haven’t ever tried Shiseido White Rose, but I’d like to. And I did enjoy SSS Velvet Rose, but I think it had a geranium-like note too? Sounds gorgeous. I do like rose, from its cheapest smells to the highest prices. Non-obvious fruit-rose. I shall try it! Hi, Moore — It’s true, there are some really beautiful luxury rose perfumes out there, but some nice simple ones, too — I remember liking the rose perfume oil sold at C.O. Bigelow, for example! There are so many lacklustre roses out there, so it’s good to hear that this one is good. Diptyque tend to do things rather well and I like the sound of a ” freshly-picked rose from a sunny garden”. Considered my interest piqued! Oh, there are many sharp/flat/thin rose scents, aren’t there? Or ones that have so much citrus or lily that they don’t smell much like rose. Or ones that have “rose” in the name but no roses listed in the notes…! Yes, it is sometimes hard to find a nice, true rose. I love both rose and Diptyque, so am really looking forward to the Australian release! Hi, Paisley! It’s such a nice house, isn’t it? As much as I love L’Ombre dans L’Eau, I’m happy to have a more “rosey” rose fragrance from Diptyque, too. Lovely review. I’m not a rose person, but I always enjoy reading your reviews of rose fragrances Jessica because you know the genre so well. I wonder if this latest Diptyque has found its way to Australia yet? I will swing past my local this morning and find out. Hm, I’m not sure about Australia… the Diptyque website only covers France, the UK, and the US. I do know that not every Diptyque vendor carries it yet, even in NYC, where I saw it at the Diptyque boutiques and at Aedes but not at Barneys. So sorry I don’t know for certain! Hi, Merlin — You know, it’s probably blasphemy to admit this, but I don’t love Sa Majeste’ La Rose. I always get a geranium note from it, and I like geranium, but something about the mix bothers me. Or maybe it’s the particular musk he used there? I think Eau Rose is more of a soliflore… it’s not trying to do anything unusual, which can be refreshing! Not blastphemy at all: almost no ‘perfumista’ I know of likes this particular serge. To me it captures some kind of red rose aroma that nothing else does! But at least one person has said it smells soapy on me, so there! Great review! I am looking forward to trying this. I hope you’ll enjoy it too, Lil! Thank you, Jessica! I am also glad that Eau Rose will join the permanent collection. It is just an uplifting, lovely rose. Your review reminded me that I still have not tried Diabolo Rose. Is it lighter than Un Zest de Rose? Hello, V! I prefer the Diabolo to Zeste. They’re about the same “weight,” but I enjoy the minty-sugar aspect of Diabolo much more than the lime-citrus notes of Zeste, which always turned a bit sharp on me. Nice review, and you really make me want to sniff it. I am dicey on roses, very hit-or-miss. I tend toward the airier type, and the “winsome pink” sounds just about right. Hi, Tama — There are so many rose fragrances out there, and many of the newer (post-Stella) ones leave me cold — but this one works for me! It’s well worth a try. I’ve been excited about this and your review makes it sound perfect for me! Can’t wait to try it! I hope you’ll like it, L!! I’ve been craving some Spring scents- and this one sounds great! Thanks for the review! Hi, Hardlyworking! They’re pushing it for Valentine’s Day, of course, but it will still be perfect for Spring and beyond! Do give it a try. When the once provocative, BO master, cumin-laden Diptyque releases a springy rose blossom, things must be really bad for them. Well, I doubt we’ll see another L’Autre any time soon… but they’ve also had florals like Ofresia and greens like Eau de Lierre for a while, so I’m not too shocked by this one. I am Diptyque crazy, when I first got into these I bought like 8-9. And I treasure them so much to me they are French where I Profiumi de Firenze are so very Italian. I cannot enough. I’m still new to the niche lines what is SSS? Can’t wait to get it at Lucky scent or beaut habit. BH has great tester kits they send out and sometimes I have gotten a purse spray from L’Artisan just for ordering. Emily and I know eachother quite well by now. She even writes down new ones I would like. Yeah for DIPTYQUE. Hi, Sarah — Hope you’ll get a chance to try Eau Rose, then! SSS is Sonoma Scent Studio, a very small (one-woman!) company based in northern California. I’m glad you reviewed this, Jessica. I was going to assume it was too “pink,” but it sounds like it would be very enjoyable to wear. I will certainly sample! This review brings tears to my eyes. My body chemistry does not project rose notes at all, they either disappear or turn sweet and migrainey. I loved Addict 2 but did not last, loved and hated Voleur de Roses – still owning it but using very, very sparingly – and love the now discontinued Tumulte by Christian Lacroix. Les Rosines give me a massive headache every one of them, no matter how light airy and beautiful they start. Stella McCartney is fine, provided it’s the elixir not the EDT. Maybe this one would work. Phylosikos disappears within half an hour, and it was one I really really wanted to like. Any ideas Jessica – or fellow readers – would be very welcome. Does anyone know a rose fragrance for men, rather on the light and bright side. I tried Rose31 from Le Labo (too much cumin) and all the male roses from Parfums de Rosine and quite liked Rosissimo which is more citrusy. Any other ideas? The only one I can think of is Hippie Rose by Heeley which I haven’t smelled yet. I just purchased this! Can’t wait for it arrive. I live in a neighborhood known for it’s lovely rose gardens and look forward to enjoying this scent. I’m waiting for Nordstrom triple points (Sept 12) and then I will buy this also. Just love it and rose gardens to. I’m counting down the days and can’t wait either. Been using my sample and already had compliments. On initial spray, I thought to myself “Lychee!” I love lychee ever since I had it fresh in Hawaii, so it’s nice to find it in a perfume. Of course the rose is also there and I don’t find it too sweet. I looked up this review and saw the notes starting with “bergamot, blackcurrant, lychee” – yes, exactly, that’s what I smell, in reverse order. It also brings to mind Diptyque’s L’Ombre dans L’Eau (which I don’t like because it’s too green/tomato plant-y), but that freshness is nice mixed here with the rose. We’ll see how long it lasts and what the drydown is like.